Canvas @ YaleInstructor Guides FilesHow do I upload a file to a course? By Default, you are given 500 MB of space within your Canvas course. For any reason you feel you need more space, please email canvas@yale.edu and we are happy to assist you. 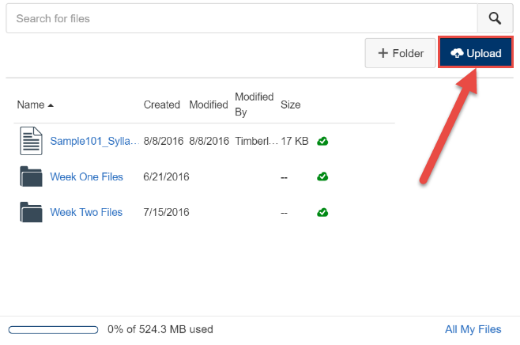 Video and media files should be uploaded into the Media Library tool and not into Files. Click the title of the file you want to upload  and click the Open button . You can also add to your files area by simply dragging and dropping the files from a file window directly into the Canvas file repository. Click the title of the file you wish to add  and drag the file to your open browser . Your file will automatically upload. If a file with the same name already exists in the folder where you are uploading your file, you will be asked if you want to replace or rename it. To rename the file, click Change Name button . This option will create a duplicate copy of the file with a different name. 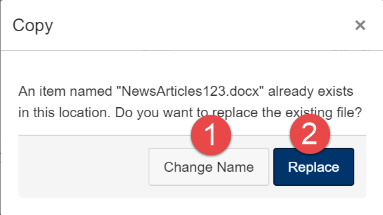 To replace the file, click the Replace button . 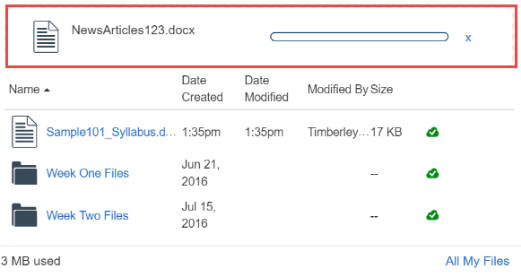 A progress bar will appear at the top of screen tracking the progress of your file upload. Click on the file name to view your file. 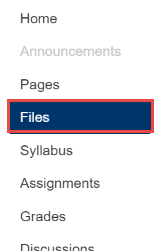 How do I create folders in my course Files area? How do I upload files to Media library? What if I have large media files?